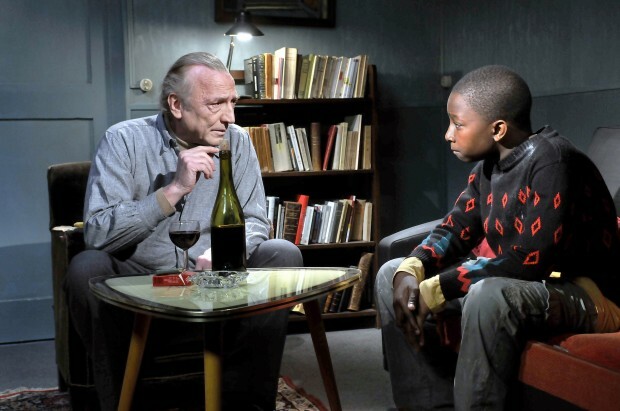 “There are no shoe shiners in France”, said my French friend C after watching Le Havre. I noticed that she had a small, troubled wrinkle in her forehead. C used to be strangely addicted to Scandinavia, but the last few years, she’s become more and more homesick. As a comfort she watches every French movie that opens in a cinema, as long as it isn’t violent. And that means that she gets to see almost every single one of them, because if they make any action movies in France, they don’t reach the Swedish cinemas. Action is something we leave for the Americans. If you go to see a French movie, you’ll find yourself in an audience which mostly consists of middle aged women with unfulfilled dreams about running away to Provence. They want to open cafés in picturesque villages and grow lemons in their gardens and make sketches in their notebooks, which they secretly hope to get published one day. They want movies that smell of red wine and rosemary, so that’s what they get. Now, C isn’t an average middle aged lady. She’d rather work as a sailor on a freighter than serve coffee in a café. But she loves to go back to her homeland, hearing her own language spoken, seeing the familiar environments, if only for a few hours. However in the case of Le Havre, I could sense a stroke of disappointment in her voice. It didn’t show the France that she knew. “People use Euro bills in it and the television looks modern, so guess it’s supposed to take place in the present. But their clothes and the places where they live look as if it was in the 50s. It’s a strange mix. And it doesn’t feel like France.” she remarked. While I’m not French, I could see where she was coming from. You would probably look in vain if you went to Le Havre and tried to find locations and inhabitants that came anywhere near what we met in the movie. On the other hand – strictly speaking it wasn’t even a French movie in the first place. While it takes place in France and has some French actors, the director is Finnish, it’s recorded partly in Finland and it’s also Finland’s candidate to the Best Foreign Language category of the Academy Awards. But not as much about the director being a foreigner as it’s about the style and choices of Kaurismäki. He’s not even going for realism. This is the story about the kind and poor shoe shiner Marcel Marx who encounters the boy Idrissa, who illegally has arrived from Africa at Le Havre with a cargo ship and wishes to continue to London where his mother lives. While his wife is at hospital, Marcel decides to hide and help out the boy and he gets most of his neighbors to help out in the project. It’s sweet as you may suspect, a fairy tale for grown-ups and it got a suitable Christmas release in Sweden. This is a film so jammed full of sugar that if there had even an ounce more added to it, it would have been sickening. But now it balances out as just incredibly cute and delightful. Frankly I wouldn’t have been all that surprised if Santa himself had turned up towards the end in his reindeer driven sleigh as a deus ex machina, giving the boy a green card wrapped as a Christmas gift. Mind you, I don’t say this in a pejorative way. It’s rather a little saddening that a film that shows people who live according to the Sermon on the Mount (which only shepherds and shoe shiners do, if we’re to believe Kaurismäki) and conveys a message about the need for love and humanism stands out as so odd, naïve and completely out of touch with reality. Le Havre is an antidote to the darkness and cynicism that most high quality movies on the repertoire bathe in. It’s a voice calling in the desert – one that we need to hear once in a while. Even if it doesn’t look anything like the real France. « Seven, Se7en or Se-seven-en? Le Havre is one of those films I keep seeing reviewed and have not been able to get a viewing yet. I really want to. I think it’s only just come up in cinemas. Until now I belive it’s been a festival feature. So be patient. Provided that they show Kaurismäki’s movies in your city, I’m sure it will come up. It’s funny, when I went to see this at the cinema, I did notice that all the other patrons were those very same middle aged women you described. I love this film, it really is a nice change of pace from seeing the grim realities of the world. To be fair I think the audience was more mixed than usual for this movie. And to my joy the theatre was packed, which surprised me a little. My tongue-in-cheek remark was more a general poking at the market for French movies, which is pretty homogenous in Sweden. This reminds me of My Big Fat Greek Wedding which, although a stupid comedy, purports to be based on Greek mores, habits and ways of life. Strangely enough, since the scriptwriter and actress in the leading role, Nia Vardalos, is herself half-Greek (but born and living in Canada), she has gotten most of it wrong. About 180 degrees. Whether on purpose, I don’t know, of course, but I hardly think so. For after all, what is the purpose of making a film purportedly built on Greek cultural traits and then not using any of them? If you haven’t seen it, by all means do so. But don’t bleedin’ believe it. Greeks wishing others luck by spitting at them? Greeks modelling their villa on the Parthenon (and on top of that stupidly having Corinthian pillars, when the Parthenon features Doric pillars)? A Greek wedding featuring a Protestant priest performing the Protestant wedding ceremony (at a Greek Orthodox wedding you have four priests, in completely different attire, and the ceremony is wholly different and takes hours)? Greeks saying “Opa, ópa” (which means “Oooops!”) for “Cheers” when they are drinking? I might mention for those of you who don’t know me that I am half-Greek myself (but a whole lot more Greek than Nia Vardalos, obviously) and live in Athens. Think about this, though – if a similar film was made about, let’s say, black people or Jews, what would its reception have been? A disaster, of course, and rightfully so. Not in this case, though. One might wonder why. To be fair I don’t think Kaurismäki is making any claims on that it’s the real France we see in the movie. He’s created this fairy tale world on purpose and basically it could have taken place in any part of the world where a ship with illegal passengers could stop. He could even have made up a country that doesn’t exist. So I don’t hold it against him. However I can definitely understand why the stereotyping of Greeks in My Big Fat Greek Wedding is a pet peeve of yours. You have my sympathies. I’ve actually seen two Greek movies this year, Dogtooth and Attenberg. Especially Dogtooth is pretty weird I guess and doesn’t show much of the “normal” Greece. It’s more of a horror-style movie. But if you’ve seen any of them it would still be interesting to hear what you think of them.